Mobile alerts, notifications and location-based emergency warning systems are now an established part of mobile government strategies in an increasing number of countries worldwide. In Australia the national emergency warning system (NEWS) was instituted after the tragic Black Saturday Victorian Bushfires of February 2009. NEWS has enabled the provision of public information from the government to the citizen during emergencies anywhere and any time. Moving on from traditional short message service (SMS) notifications and cell broadcasting to more advanced location-based services, this paper explores the major issues faced by government, business and society at large, toward the realization of a fully fledged emergency system for personal mobile devices. This qualitative study contains two phases: phase 1 gathered issues from the general public via an open-ended survey question, and phase 2 gathered issues from key informant interviews. The data was analyzed using qualitative content analysis techniques. The results are presented in a narrative form granting detailed insight into the main challenges faced in the deployment of a mobile government application. The complex interplay between government agencies, telecommunications carriers and the Australian public is presented, ultimately leading down a path of regulation. By using a qualitative approach it is hoped that the intimate lessons learnt in the Australian landscape can be applied to other nations considering mobile government applications. The outcome of the paper is predominantly practical providing a series of recommendations toward the successful deployment of mobile government applications. On February 7, 2009, the Black Saturday Victorian Bushfires claimed 173 lives, the worst peace-time disaster in Australia’s history. Citizenry looked on in disbelief that in such a modern society equipped with advanced technologies, so many lives were lost and a multitude more people injured given the force of the 400 raging fires. The Australian federal government responded swiftly to the tragedy by enacting an emergency declaration as an amendment to the Privacy Act 1988 on February 11, 2009. The emergency declaration now means that some government agencies, and emergency service organizations (ESOs), have access to Australia-wide consumer telecommunications details in the likely event of an emergency or during an actual emergency. Maintained by one commercial operator, the integrated public number database (IPND) is an industry-wide, commonwealth-owned database that contains all the residential and business telephone numbers, both listed and unlisted, and other subscriber information such as name, address, and the type of service delivered by each number (i.e. landline, fax, mobile, pager, etc.). During an emergency the IPND may be accessed by more than one commercial entity to assist citizens. The Victorian Bushfire Royal Commission (VBRC) commenced on February 16, 2009 and about five months into the proceedings, the Government released a tender document to Australia’s telecommunications carriers for the supply of ubiquitous mobile technologies, infrastructure and applications that could be used during emergencies. The National Emergency Warning System (NEWS) tender was released on July 15, 2009 and following this, the request for information (RFI) for Location Based Identification of Active Mobile Handsets for Emergency Notification Purposes (phase II of NEWS) was issued on August 5, 2009. Telstra, Australia’s largest telecommunications carrier was awarded the contract on September 24, 2009. The NEWS applications have the ability to deliver personalized information direct to the mobile phone subscriber during an emergency, providing both warning notifications and alerts and specific directions, complementing traditional broadcasting mediums like radio and television. Despite the call for the deployment of ubiquitous mobile government applications in the Australian emergency management sector since as early as 2005, it took the tragic loss of life in Victoria for the Federal and State governments to make a decision to go forward with a homogeneous national emergency warning system (NEWS) with location-based features entering in phase II of deployment. Only than two months before the Black Saturday Victorian Bushfires, the authors began to collect qualitative data on the potential deployment of location-based services in emergency management in Australia by calling on key informants to share their experiences and insights about the future prospects of location-based emergency warnings. On November 25, 2008 an in depth semi-structured interview was conducted with an official from the Victorian State Government. It was quickly realized that no matter how innovative the business model, that the complexity of a national emergency warning system with location-based service capabilities meant that operational and non-operational stakeholders would have to work together closely toward a long-term mobile solution that could be utilized by relevant government authorities to communicate with people in affected zones of natural and human-made hazards. The government official interviewed described the need for a ubiquitous emergency warning system with a degree of urgency that was to play out in that summer. So what went wrong, especially when the need for such a system was evident? Why did it take so long for such a mobile government application to be deployed? What were the barriers that needed to be overcome for such a practical solution to be instituted? The interplay between government agencies, telecommunications carriers and supporting value chain members, and the Australian people would ultimately lead down a path of regulation. This paper explores the most important issues faced by government, business and society at large, toward the realization of a fully fledged location-based emergency warning system for personal mobile devices. By using a qualitative approach it is hoped that the lessons learnt in the Australian landscape can be applied to other nations as a foundation model towards deployment of mobile government applications in related contexts. This paper is divided into five sections. Section 1 describes the methodology that was adopted, the main sources of data, and how data was collected and analyzed. Section 2 describes the need for location-based emergency warnings and Sect. 3 describes the legislative impact of these services being utilized and liability related issues such as responsibility and accountability with respect to the government itself and telecommunications carriers. Section 4 is about the prospective barriers facing governments and carriers who wish to roll out a national emergency warning system and the fifth and final section provides recommendations toward successful deployment. A case study of mobile government applications in the context of emergency management was conducted in Australia with a focus on the utilization of location-based services for emergency warning and notification systems. Figure 1 depicts a timeline of important events leading up to the deployment of NEWS. The study was conducted between 2008 and 2009 and captures sentiment in Australia both before and after the Black Saturday Victorian Bushfires. Data for this case study was collected in a two phased approach. In Phase 1, a ten page questionnaire which contained a single open-ended question was administered in 2008 to the general public providing an opportunity for written responses which were digitized, collated into a database and then analyzed. The primary goal of the open-ended question technique was to understand the issues pertaining to the utilization of the location-based emergency service as perceived by the general public. This technique is particularly useful when there is a need to start with a broader exploration of a little-known phenomenon . The comments included personal opinions, remarks, concerns and real life experiences that about 60 of the 300 respondents were willing to share. In Phase 2, nine full-length semi-structured interviews were conducted with key informants who were members of operational and non-operational stakeholder entities and highly regarded within the Australian landscape of mobile government for emergency management. The interviews were transcribed, edited, and qualitatively analyzed. The use of qualitative methods, such as interviews, has been suggested for exploratory research when little is known about the area of study and when there is a need to identify unanticipated or new issues [2, 3]. Independent experts with a wealth of knowledge and expertise, officials from Australian emergency service organizations, policy makers from Australian government departments pertinent to emergency management arrangements and policies, and representatives from the Australian mobile telecommunications industry were approached to participate in the study. The main criterion for approaching each potential interviewee was their expertise. Several government departments and organizations related to emergency management were also approached. The intention was to end up with a good cross section of diverse profiles in the location-based services (LBS) value chain that could give a holistic view of Australia’s national emergency warning system. Nine interviews were conducted with key informants coming from both operational and non-operational stakeholders. Interviewee 1 [Vic-Gov] was a member of the Office of the Emergency Services Commissioner in the Department of Justice in the state of Victoria. The Office provides leadership in emergency management for Victoria, with specific responsibility for ensuring the delivery of efficient, equitable and integrated emergency services. The Office oversees more effective utilization of the common resources of the emergency services and encouraging and facilitating cooperation between all agencies before, during and after an emergency . It is important to note that this interview took place only a few months prior to Black Saturday Bushfires in Victoria. Interviewee 2 [expert A] is an independent expert with more than 40 years of experience over several domains including teaching in emergency management and being an emergency service officer with the State Emergency Services (SES). Interviewee 3 [SES] is employed by the State Emergency Service in New South Wales. The SES is an emergency and rescue service dedicated to assisting the community in times of crisis. It is made up almost entirely of volunteers, with 226 units located throughout the state of New South Wales (NSW) alone. Its main responsibilities are for flood and storm operations . Interviewee 4, [Whispir-Rep] was a representative of the Whispir company, an Australian company providing a high availability messaging platform that enables the instant and automatic invocation of communications across web, email, SMS and voice channels, from any location including from a mobile handset . Interviewee 5 [expert B] is an independent consultant from the Australian Capital Territory. He is a well-known consultant who has a professional background working as an advisor on large-scale systems for the Australian Government including the formulation of national internet ICT polices. Interviewee 6 [expert C] is an independent expert from the state of New South Wales with a telecommunications engineering career spanning more than 30 years. His work has contributed to the development of service creation environments for Intelligent Networks (IN) with British Telecom Research Laboratories, and later with Telstra. He has also worked on several worldwide projects developing a range of solutions with a focus on wireless IN services and the development of various cellular location systems for emergency and commercial services. In addition, he was amongst the scientists who were responsible for shaping, initiating and launching E911 in the United States. Interviewee 7 [expert D] is an independent expert from the state of Queensland. His current work involves the development of new innovative technologies. He has extensive experience in Research and Development (R&D) of internet and mobile technologies. He has research interests in emergency messaging standards, new technologies and applications for emergency messaging and national emergency warning systems. Interviewee 8 [expert E] is a consultant who works for a large law firm in Australia. He is a communications specialist with more than 25 years of experience in technology, regulatory and business strategy in telecommunications and broadcasting. He has been involved with a number of significant commercial regulatory projects in the telecommunications sector in Australia and abroad. He has provided advice to Telstra, Bell Canada, the GSM Association, State and Federal Government and international organizations such as the World Bank. The final interviewee is a representative from the Redcoal Company. Redcoal is Australia’s leading SMS messaging and mobile phone tracking solutions provider, delivering services across different industry sectors and government. Redcoal’s SMS and mobile phone tracking solutions are rebranded and resold by the Optus Network. The Optus operator is the second largest telecommunications carrier and information services company in Australia . A summary of the nine interviews and their background is presented in Table 1. Qualitative analysis refers to the process that requires the identification of recurring ideas, patterns of beliefs and salient themes from collected data and the attempt to demonstrate support for them . Patton  defines qualitative analysis as the challenging process of transforming data into findings, but more importantly, for it to make sense. Patton described the transformation process as “reducing the volume of raw information, sifting trivia from significance, identifying significant patterns and constructing a framework for communicating the essence of what the data reveal” . Similarly, Marshall and Rossman  regard qualitative analysis as the process of bringing structure and meaning to the mass of the collected data, and accordingly, postulate that the best approach to the analysis of the data is “reading, reading, and reading once more through the data, forcing the researcher to become familiar with those data in intimate ways. People, events, and quotes sift constantly through the researcher’s mind” . However, in order to guide the qualitative analysis to ensure validity in the presentation of results, the transcribed interviews were parsed together through an automated content analysis tool. Figure 2 shows the main themes as determined by the Leximancer tool  after several interactive manual interventions to: (i) clean the auto-generated thesaurus list of words (e.g. singular vs. plural, merging synonyms or like terms, and the merging together of words into short phrases like “location based services”); (ii) delete irrelevant terms that may have been used frequently but in essence detracted from the main themes of the study (e.g. “should”, “think”); (iii) add words to the visual concept map from the auto-generated thesaurus that were considered significant in meaning by the researchers but may not have featured in the most highly ranked concepts; and (iv) consider at which level of granularity to view the concept map to best understand the inner forces at play between the major actors in the network. These themes were used to provide core issues that were explored in the narrative thematically. Issues raised in the open-ended response in the survey were manually grouped into themes and supporting literature found to validate their inclusion in the narrative (Table 2). In Miles and Huberman’s  interactive model of analysis, the qualitative analysis is an iterative step that consists of a set of activities, including data collection, data reduction, data display and conclusion drawing. The textual data of the interviews went through preparation processes to make it ready for the analysis. The audio-recorded interviews were transcribed verbatim and each transcription was kept in a separate word document for easy reference. The hand-written interview notes, which were taken by the researchers themselves in each interview, were used as an additional source of information. In a similar fashion, all the comments from the open-ended survey question were typed and then aggregated and kept in one document, as all comments represented the perspective of a single distinct stakeholder of the locationbased mobile phone emergency service (i.e. the prospective user of the service). Initial data coding, including preliminary data reduction processes were performed to prepare the data for analysis. Developing concepts is regarded a way of data reduction  and enlisting the support of Leximancer was very helpful in reducing the volume of interview data to displaying correlated concepts into more focused themes. Displaying data is one of the major ways to validate the qualitative analysis . This activity is concerned with organizing, compressing and assembling information into a more readable format from the data’s voluminous, bulky and dispersed original state . The qualitative data can be displayed in different forms such as charts, diagrams or concept maps. The aim of the final stage which is drawing and verifying conclusions is required to generate a meaningful and coherent picture of the data . Miles and Huberman  noted that conclusions take place, more or less, concurrently with other stages in the content analysis and can be discerned early in the analysis, although at that time they are vague and not truly developed. In all cases, drawing conclusions is typically regarded the most difficult stage to perform amongst all the stages of the analysis since it involves developing propositions, verifying these propositions, drawing solid conclusions and confirming the obtained findings [8, 25]. Australia’s future need to utilize the location-based mobile phone service within its national emergency warning system fundamentally stems from the practical characteristics of the service, which complement other channels of safety information. As stipulated by Expert A, the broadcast media do a very good job of communicating emergency information to the public but there is no guarantee that information is received by individual persons, especially if they have no desire to keep informed at any given time period. Expert C pointed out that everybody does not listen to the radio. The Black Saturday Victorian Bushfires, more than any other single event in Australia’s modern history can be used to illustrate the need for advanced communication services. As Expert A reflected, Australians questioned where the notifications were and why so many people had to die: “[t]he notifications were being [sent] out in the normal fashion by radio, television, but because people were outside, it [did] not necessarily mean that they tuned in to those radio stations, or the television ...” It took the deaths of 173 Australians during a tragic event for the government to consider more innovative ways to communicate with the community before, after and during an event. There is now an “expectation by the community to be informed [in a] timely [fashion], rather than in a haphazard way” (Expert A). One way forward is to make use of the mobile phone, available technology already in the hands of the majority of Australian adults, which can provide crucial emergency information dependent on where the mobile phone is located. While you cannot guarantee that people will receive time-critical information via their mobile phone (e.g. it may be turned off), at least authorities are making “use of available technology to reduce the likelihood of people not knowing and increasing the likelihood of them being informed” (Expert A). Other interviewees also acknowledged the shortcomings of the current information warning channels in Australia and the need to utilize location-based public warning notifications. Expert D was categorical in his assessment: “I definitely think we do need location-based warnings. There is no doubt about that.” While making use of landline billing address details for emergency notifications was one possible way forward using the legacy Integrated Public Number Database (IPND), Expert D preferred a warning system that could detect people roaming and provide customized location-based information. Vic-Gov also noted that they ultimately wanted a system that could be deployed during the largest and most troubling types of emergencies. Three months prior to the Victorian Bushfires, a Vic-Gov representative contacted the authors, desperately seeking to put in place a system that could be used to notify individuals anywhere they were during large-scale emergencies in order to save more lives. For Vic-Gov, traditional forms of media were passive. From their assessment of a range of technologies that were nationally consistent, Vic-Gov was convinced by the power of the mobile phone and especially its ubiquity, not requiring an individual to be anchored anywhere to receive the given information. Vic-Gov stated: “People have, invariably, got their mobile phones with them. Usually, they are turned on. And so, if that individual with an active handset is within an area that has been affected by something there is a very high likelihood that we will get a message to them, informing them that we know that they are in the area and we can point them to other sources of information. So, they do not need to be anchored to anything. It is the closest [thing] to somebody’s eyes and ears.” For the State Emergency Services (SES) the location-based mobile phone service can be considered yet another telephony-based channel to get a message to the public. SES highlighted the potential of the mobile phone to get people’s attention, especially if a disaster was to hit late at night when people were asleep. Written comments from the survey respondents also reflected the community’s expectation toward the introduction of the location-based mobile phone emergency service in Australia in the near future. For the greater part comments focused around the need to have the location of an emergency caller automatically identified and tracked. One respondent noted that when calling emergency services 15–30 seconds “are wasted in providing the patient/caller location/address. It would be a great time/life saver technique if LBS is properly implemented by service providers as the police, hospitals and car-service providers as NRMA.” Numerous respondents thought that implementing such capability would be a good idea, practical, and very beneficial given Australia’s history of natural disasters. Some were even prepared to subscribe to such a service for up-to-the-minute information. Beyond the obvious advantages of location-based notifications via mobile phones, there is one segment of the community that would particularly benefit from the introduction of such warning systems. Vic-Gov noted that such a system would be highly beneficial to the profoundly deaf and hearing impaired which affect one in six Australians: “[i]f these people were in an area where they had been affected, they would receive a text message ... So, by default, I guess, we have addressed a section of the population who struggle to receive [comprehensible] notifications ...” Expert A showed his disappointment at the lack of urgency shown by some stakeholders, especially government, when he said: “[i]t is about time we had these systems in place. We see money being wasted in a lot of areas that are not as important as providing safety to our communities. And for a long, long time, disaster management and all those type of activities have not been at the forefront of government action. They tend to wait until after something happens.” The Redcoal-Rep echoed similar sentiments when he noted that it generally takes tragedies for a reaction to come from government, and only then when it is a vote winning issue. The introduction of a comprehensive legislative framework which would regulate the utilization of location-based mobile phone emergency services was a recurring theme which emerged from the expert interviews. In Australia at least, it was found that without a legislative framework in place the introduction of a location-enabled emergency system would be somewhat unlikely. The lag between the introduction of new enabling technology and the establishment of legislation to support that technology’s capabilities can be stifling to the development of any new product or process. SES identified the government as lagging behind in clearly providing protection around the governance and use of location-based emergency notifications to all Australians. The emphasis is on the deployment of “blanket coverage” technology which is where the government needs to get started on legislating, according to the SES. But rather than the view that legislation comes first, and then the technology can be rolled out, in this particular mobile government case study society is evolving hand-in-hand with the technology. “Location-based services can be protected by legislation and need to be protected by legislation... You have to evolve your legal framework along with the technological underpinnings of the society it involves” (Expert C). The introduction of early warning systems by their very nature cannot be put in place without some kind of a legislative or regulatory imperative. For Expert E, the fact that location based early warning systems would need to be deployed unilaterally—that is across the whole population—a liability risk would be incurred as part of any set of legislative regulations or responsibilities. The actual scope of risks and responsibilities would need to be defined but in this open-ended environmental context there would be an arbitrary amount of potential liability. “There has to be a fundamental foundation from a regulatory and a policy perspective before any of this can happen”, reaffirmed Expert E.
Numerous survey respondents also confirmed Australia’s need for a legal framework to support the possible utilization of the location-based mobile phone emergency service, with clear rules and penalties to effectively control the utilization. One respondent noted that there should be “strict guidelines and rules for how and when the [location] information should be used, and significant penalties for companies that break these rules as well as appropriate compensation for the affected people.” Another respondent wrote that strict laws should govern what information is kept, how it is kept, and who has access to it. The idea of penalties for misuse of location information was also raised. Respondents were divided on whether or not to introduce completely new legislation or amending existing legislation so that the immediate use of location-based mobile phone emergency services could begin. One respondent was concerned that quick “fixes” might open a door for potential gaps in the implementation of the amended legal framework in a way that could be employed by third parties for purposes other than emergencies. Another respondent was circumspect about the law in general: “[e]ven with policies or laws which are created, I am worried about quick laws being passed to authorities to allow them to use our data for surveillance without us wanting to.” This respondent was more concerned about the authorized use by external parties than unauthorized use. There can never be any absolute guarantee that an error will never occur when location-based mobile phone solutions are utilized under the national warning system in Australia. Different types of errors could originate such as, unintentional human mistakes and sudden faults in underlying technologies or infrastructure. However, several issues arise, especially if there is the likelihood of loss of life due to an error. Expert D maintains that there must be the ability to identify where the error occurred in order to take the appropriate action against an entity and that someone is held liable for that mistake, especially in the event that there is loss of life as a result of that error. Consider the complexity of the LBS value chain and the scenario whereby the Bureau of Meteorology sends out a cyclone watch message via a third party provider, who for some reason downgrades the message eventually misinforming the public. Thus, “defining the source of the error is a condition to defining the accountability of each party involved in these solutions” (Expert D). It may be difficult to understand how a government can be held accountable for its actions (or inactions) but Royal Commissions in Australia are common, providing a platform for major governmental public inquiries into a given issue. For example, there was a 2009 Victorian Bushfires Royal Commission (VBRC) which handed down its final report on July 31, 2010. In the context of LBS for emergency services, the interviewees were not in agreement on who for instance would be held accountable if a person did not receive a warning message at a crucial time. The SES pondered on such a scenario: “[i]f I do not get that warning message that I have been promised that I am going to get on my mobile phone and my family or I am hurt as a result of that, my question to government is going to be: ‘Well you promised you were going to tell me and you have not and I have suffered this damage from it.’ I would be heading down the road to one of those barristers and I reckon I would have a pretty good case.” Realistically, however, another interviewee noted that no technology or system is fool proof, and that given LBS solutions rely on technology, the government cannot be to blame for system errors which are squarely outside their control. There is nothing to say that at any given point in time, something could go unintentionally wrong with the technology. Accordingly, what is needed in the Australian context is to set comparable accuracy requirements that practically define the responsibilities of the telecommunication carriers and/or the government when location-based services are utilized nationally for emergency management. It is the operators who need to be held responsible for achieving those levels of performance, not so much the Australian Government. Expert C said, “[y]ou can use that mechanism to ensure that the operators are applying all the due diligence that they should be doing, that their network is as optimized as effectively can be on any kind of reasonable cost analysis basis, but at the same time it means that you are not going to hold liable that operator for an individual event where in fact the location information was not correct with respect to that location determination. And with respect to the performance of location systems generally, I think you have to have that realistic underpinning within the requirements of the government legislation.” Further consideration of the accuracy issue reveals that there needs to be a fine balance. The operator needs to be doing everything they can based on a given set of performance metrics without putting themselves in a liable situation so that any given individual at any given period can claim arbitrary large dollar amounts for damages (Expert C). Service level agreements or defined contracts are the most logical and practical of options to define and regulate the relationship between the government and the telecommunications carriers. These contracts can also serve the purpose of defining the responsibilities when and if something goes wrong. Expert E complemented the views held by Expert C, looking at the dilemma surrounding accuracy of location information as a contractual issue. He said that ultimately it had to do with the contract between the service provider and the acquirer of that service. The acquirer in this instance is the Government (at the State or Commonwealth level) and they would have agreed on a series of service levels pertaining to location-based services for the emergency context. This is distinctly a jointly developed government and business model. This is a very important observation, that mobile government applications by their very nature are not, and cannot be, models exclusively built by a single stakeholder, but rather a collaborative effort between stakeholders (Fig. 3). Expert E played out a possible scenario based on the contractual relationship. “If somebody sued the service provider [for inaccurate location information], the service provider would say: ‘Well, I do not have a contractual relationship with you. My contractual relationship is with the state, so go sue the state. And if the state has a problem, then they will join me in that action [as a party] anyway.’ ” As Expert E’s scenario further developed, an individual who had been adversely affected might then sue the state for damages and to the extent that the state attempts to file an action against the service provider, that action will be limited by the formal contractual agreement. In this instance there are legal limitations on being able to underwrite against loss of life—“your indemnity for loss of life and the warranty on loss of life would end up being incredibly specific” (Expert E). The agreement would most probably say something like- the responsibility for life lies with the contractor, not the service provider. Expert E role plays in the shoes of the service provider: “[w]e will, of course, look after a death that occurs, for example, in the installation of the equipment that is going to be used to provide the service but not as something that occurs as a consequence of the service not being available or not working the way that you expected, except to the extent that we said it will work that way.” It quickly becomes apparent from the interviews that not a single stakeholder type, especially Government, will commit to one hundred percent availability of such services. Expert A argued that the responsibility of the location-based warning system should be added to the existing list of responsibilities that are executed by the disaster management committee in each State and Territory in Australia. “Each state already has a committee for disaster communications. That is part of their roles and responsibilities. I see this as being very simple, easily linked into that. It should not take any additional bureaucracy to be involved.” Expert C perceived the responsibility to be a multi-dimensional role that should be distributed according to the specific function each party is fulfilling under the utilization of the location-based warning system. These parties include different government emergency services agencies, in addition to the telecommunications carriers. Responsibility is distributed across agencies that are best equipped with maintaining different aspects. Expert C stipulated that network operators should be responsible for location determination systems, the ultimate reliability of the location information, and the performance and capacity of the location determination mechanisms. Network operators would also be responsible for the integrity of the location information itself, but how that location information is used must be the responsibility of the agency and not the network operator. At the time of the interviews, which government department would be granted the role of the control authority under the national location-based mobile phone emergency system was still unknown. The Victorian government official believed that it should, at least, exist at the jurisdiction level. “Who is going to run this thing? Who is going to own this thing? I do not have a clear answer for you because it is still a question that I keep asking. I think it should certainly rest on a jurisdiction level because the emergency management arrangements exist at that level” (Vic-Gov). But more importantly, a control authority at the federal level should also exist to ensure consistent quality levels of the location-based mobile phone emergency services anywhere in Australia. “Every Australian citizen is entitled to receive a message if they are potentially in an emergency situation. Now, if I was traveling throughout the Northern Territory, Queensland or Western Australia, I would dearly hope that the quality of the service provided to me was equal to that which I received in any other State or Territory. So, from a federal perspective, there would need to be guidelines around what that meant... ensuring that [each state] was delivering that same quality of service countrywide” (Vic-Gov). Expert C identified Emergency Management Australia (EMA), which belongs to the Attorney-General’s Department, as a good candidate for the role of the control authority over the location-based mobile phone emergency system on the national level in Australia. It was the opinion of a number of experts interviewed that a common approach and platform within a consolidated agency was required for the successful implementation of a national warning system, alerting people of diverse emergencies as they occurred. Among the responsibilities that the EMA might enjoy include: maintaining the reliability of the national emergency warning system platform, maintaining the privacy of any personalized location information gathered according to the Privacy Act, the structure and contents of distributed warnings, the management of the geographic boundaries and the integrity of the interfaces to the networks for getting the location information (Expert C). Implementing an opt-out feature in a national emergency warning system complicates the network design. Expert E plainly concurred with other interviewees, “I cannot see that working.” Opting-out is fraught with a number of concerns. For instance, what if two people share the same phone, and one wishes to opt-in and the other opt-out? Taking the possibility further Expert E developed the scenario: “[i]f one opts-out and the other dies because they did not get an emergency warning because of the opt-out, I would not like to be representing, for our firm, the people who are sued because of that.” Thus opting-out just does not make sense. The official from the Victorian Government also shared a similar opinion: “[i]f they opt-out and they did not receive the message and then the unfortunate event occurred where they lost their life, it would not be well received within the Coroners Court as to why they did not get the message and why we could not have, when provided everybody else, with a means of maintaining their safety.” For Vic-Gov the national warning system should neither be opt-in nor opt-out. However, the following are some interesting points of view on why there is a need to enable the opt-in and opt-out options in the location-based mobile phone warning system. Expert C in particular voiced his bewilderment at why the Government placed such constraints on the solution, without allowing people to opt-in or opt-out, instead automatically applying the solution to everyone. Expert C correctly identified the usefulness of opting-in to emergency warnings, because one might have an interest in a given area despite not actually being there during a disaster, and want to be kept informed about the latest developments. For Expert D, the facility to opt-out should be an option, independent of why someone does not wish to receive messages that might aid their survival. He noted that there are five levels of threats, and that one could build a warning system that was dependent on the severity of the warning. Level four and five warnings, for instance, may not provide an opt-out feature due to the severity of the emergency, simply if one is in that geo-location then they will receive a warning message. But for lower level warnings that do not have an impact on one’s life, an opt-out option should be offered. “Some people will be interested in certain things for different reasons. I think it should be recipient driven because you cannot make too many assumptions about the communications people want to receive”, said the Whispir-Rep. There are some complex use-cases surrounding the deployment of such warning systems but providing people with the choice is very important and not difficult. The Whispir-Rep considered that such a choice could be made by providing an interface whereby people could manage and maintain their own profile. For instance, what happens to people who have several mobile phones for different reasons, should all their phones ring at the same time to let them know a single message has arrived in their inbox. Survey respondents from the general public did identify factors related to accuracy, currency and responsiveness of location-based mobile phone emergency services. Most prominent in their remarks was the need for acceptable quality levels. A recurring theme amongst respondents was that for such a warning system to work, the information provided by the service must be accurate and timely and reliable. In this manner it would lead to personal safety but otherwise fail. Respondents did not expect a service that was always accurate as they did not consider technology to be perfect per se, but they did emphasize the need for only a very small margin of error. One respondent wrote: “I have some concerns about the accuracy. Sometimes it may not direct you to the right position in the shortest available path.” A number of respondents distinctly discussed “quality” and others “product reliability” but emphasized that without quality and reliability the LBS warning service would be useless. Other conditions the general public identified included that the service should be heavily regulated, controlled, optional, and free to use. Some respondents were also very concerned about how personal information might be misused but when it came to safety were concerned about the possibility that incorrect information would be dispersed or late data arrival would only add to the confusion during an emergency. People also highlighted the pitfalls of late data arrival via SMS which if not timely could cause panic and chaos amongst the general community which would be even more hazardous during an emergency situation. When Expert C was asked about the impact of trust on location-based services for emergency warnings, he replied “[u]sing the telecommunications network channels as a mechanism for warning people in emergency services is something I would trust to the extent of it being better to have it than to not have it.” It is perceived that most people who received an emergency alert from an emergency authority would consider it to be beneficial. Expert C explained further: “the information that I received by that alert I would trust to the extent that I trust emergency services to get it right, but that is not the technology’s problem, that is just the general perspective on how reliable and trustworthy public authorities are in any case.” Similarly, Expert B commented that people trust firemen more than they trust politicians, so trust in a location-based emergency warning alert system for tsunamis, fires, earthquakes and so on, should be accepted by the general public, if not highly favored. A close examination of the responses by the expert panel implies that people’s trust in the location-based mobile phone emergency service would actually reflect their trust in the actual services, in addition to their trust in the authority that controls and provides the services. The Redcoal-Rep preferred to rephrase the question reflecting: “Will people trust it? I think the question should be will they trust it more than the existing modes of communication, which is the media? I would imagine, to a large extent.” However, building people’s trust in these advanced services may require educating the general public about the specific benefits of these services for emergency management and also on the limitations of the capabilities. For Vic-Gov awareness was very important where trust in services and the authorities who offered them was a concern. “Once we have educated them [the public] on the fact that this technology exists and that, potentially, at any time they could receive such a message, a large percentage of the public would trust the message they will be receiving.” In general, people’s trust in location-based services is a key element to the success of the services within the national arrangements of emergency management in Australia. One respondent commented that while the service was good, that her only concern was whether LBS would be a trusted product for emergencies. This respondent also drew a close tie between trust and privacy. Another respondent rightly commented that if LBS became a highly trusted service that could be used for emergencies, only then would it be possible to prevent many deaths and other losses. 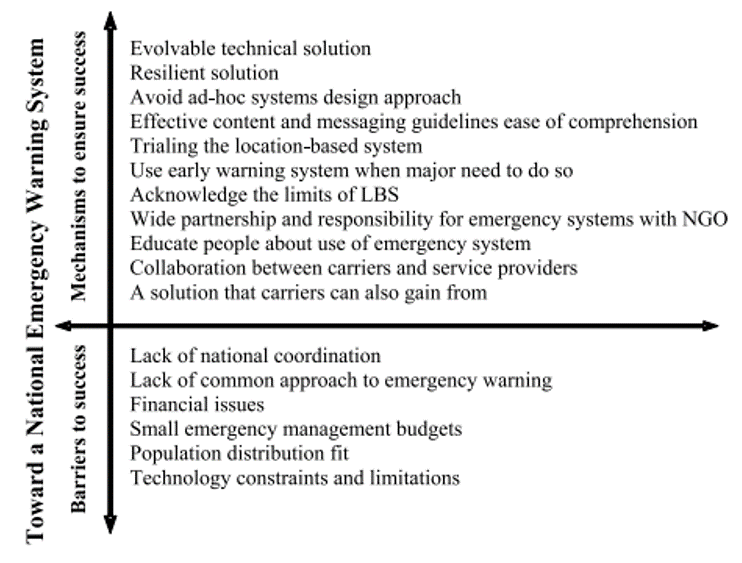 The risks associated with the use of location-based services as emergency services were considered to be just like any other technology (Expert C). Nonetheless, one of the social risks that could be specifically associated with using location-based services is the possibility of not informing or instructing individuals properly in the case of an emergency. According to Vic-Gov the risk was not so much with the LBS technology but rather how people might react when receiving a message. In all the interviews with the expert panel it was found that any potential risk that may be associated with location-based services utilization for emergency management in Australia will be far less than the risk of not introducing these services at all. The Redcoal-Rep spoke about the difference between perceived risk and actual risk. For him, the perceived risk from the public is that the LBS infrastructure might be used for other applications other than for emergencies, heralding a type of function creep. But in terms of the actual risk, the Redcoal-Rep was circumspect in saying that “you need to consider the fact that any business technology may fail. That risk is common for any new service or even existing service that is in place.” The Redcoal-Rep also discussed the notion of relative risk, in this case, the risk of not implementing a nationwide emergency service. Quite often the perceived risk far outweighs the actual risk. Indeed, the risks of not introducing location-based services for emergency management in Australia have been manifested in the recent trend of the Australian Government which followed the tragic 2009 Victorian Bushfires in identifying the compelling need for utilizing location-based mobile phone technologies for emergency management purposes on the national level [26, 27]. The position of Vic-Gov on the matter of privacy was quite straightforward: “[i]t is not something that we are going to use to even identify the name of the person necessarily. All we are interested in is that phone number within the emergency area at the time of the event.” For Vic-Gov it has more to do with making the individual more resilient and providing them with information which helps them to make informed decisions. If people can call triple zero in Australia without any expectation of privacy, then the privacy associated with this [LBS] should similarly not be an issue reasoned Vic-Gov. It will be the same organizations which will handle the information, save for the potential for evidence to be used in exceptional circumstances like in a Coroners Court. In the case of an emergency the essential identification of personal information, such as the mobile phone number, should never be perceived as a threat. This sort of identification might be the only approach for the government to provide locationbased mobile phone emergency services to people, thus the needed safety information to counter or deal with that emergency. The only difference here is that in triple zero calls, an individual volunteers their personal information for safety purposes, while in an emergency warning setting the Government makes a judgment regarding the safety and well-being of their citizens. Vic-Gov again reiterates: “[t]he only aspect that we are interested in is the number. If there was another way we could send a notification to that handset whether to the IMEI [International Mobile Equipment Identity], or something like it, that would do us as well. It is whatever will allow us to get the message to that handset in the most efficient manner.” The Vic-Gov official insisted that this mode of identification for emergency purposes cannot be labeled as collection of personal information and, therefore no privacy concerns should be perceived. She said: “[i]t depends ...on what your definition of collection is. I would prefer to talk about it as being purely identifying active handsets at a point in time because a particular event has occurred and we feel an obligation to notify those handsets that an event has occurred and there is the likelihood that they could be impacted by it. We are not collecting anything. We are identifying the handsets that were there at that point of time and that is the extent of it.” There needs to be a clear distinction between the possibilities of a breach in privacy in government applications like the national warning system, and those pertaining to commercial entities. In a commercial context it is expected that consumers might have grave reservations about LBS, even though carriers have been storing this information since the inception of their networks. The identification process of individuals cannot trigger any privacy concerns since there is basically no breach to people’s privacy. Vic-Gov further explained that from the emergency management perspective, the Government will not have visibility of even who the individual is; they simply require a mechanism to notify a person that they may be in a potentially dangerous situation. Whether it is the handset ID or a handset phone number is irrelevant. Nonetheless, while the majority of people would most likely overweigh the potential benefits of LBS over any associated concerns, the benefits alone may not stop some individuals from continuing to perceive the use of LBS as an invasion to their privacy even during emergencies. “There are people in the community that would actually find that an invasion of their privacy. Strange as it may seem, there are people like that out there, but I think the majority of people would not be too concerned about receiving a message if it was aimed at helping them to survive a threatening situation” said Expert A. Although there was an overwhelming appreciation for LBS utilization as an additional useful emergency tool by the survey respondents, nonetheless several comments heavily expressed the concerns people had about the privacy of the individual in Australia if and when LBS were utilized for emergency management. One respondent wrote: “I am very concerned about the impact this technology would have against civil rights, including lack of privacy.” Numerous individuals were concerned about the misuse or abuse of individual location data: “[m]y concern is what happens if government abuses the use of LBS?” and again, “there must be limits on the access of the services”, and another “I would be concerned with the negative aspects that may arise, specifically if the data is misused.” Now in all of these instances, individuals did point out that they saw an emergency warning system facilitated through their mobile as a good, beneficial, and positive idea that they would support, but individuals also were not devoid of thinking about the “what if” scenarios. One respondent listed his concerns as follows: “1. Loss of control over personal data, including location data. My privacy would be compromised. 2. The potential for my data to be misused by unauthorized individuals. 3. Anxiety relating to other parties knowing my location at any given time and making inaccurate assumptions about me/my family. Safety concerns are also relevant here.” On the latter issue of personal safety, one respondent raised the point of the potential for private information collected about geolocation to be distributed or shared amongst the third parties affiliations of telecommunications carriers. This issue was not just about sharing data but also that the data collected by the carrier could in no way be guaranteed in terms of integrity. The risk of unauthorized access of an individual’s location data would in fact be a breach to personal privacy, said another respondent. Privacy issues associated with utilizing location-based mobile phone emergency services were perceived as a problem and a real source of concern to the people who had responded to the survey, and who were likely to consider themselves amongst the prospective users of these government emergency services. This is despite people’s critical appraisal of the significant benefits of the services for emergency management purposes (Table 3). Interestingly enough, one explanation of why people might perceive the use of location-based services as an invasion to their privacy, even during emergency situations, is given by an emergency management expert who believed that individuals who had never been in a serious emergency before would still outweigh his or her privacy over anything else. The expert from SES who works in emergency services has experienced situations where people can be caught up in danger very quickly. While he did not mind receiving an SMS if he was found to be in the area, to assist others out of harm’s way, he commented that a citizen who had probably never seen a lot of these situations, might find himself/herself thinking that access to sensitive location data was an invasion of their privacy. Table 3 People’s perceptions of privacy: representative responses ID Representative privacy related comments from the survey response 1 I agree that there are many advantages in using LBS. But, I also note that my location information can easily be misused as well. Tough laws need to be passed prohibiting unauthorized use of personal information (location) without user’s consent/authorization. But, even with the existence of tough laws, the possibility remains for others to use information about one’s location. 2 I like the idea that LBS should be used in case of emergencies. However, with recent events ... that law enforcement here ignored the rights to privacy, the conflict of rights to privacy and the importance of security need to be addressed. 3 I would be concerned about my location information being used without my permission. If part of using LBS included my location information being used by third parties e.g. advertisers, I would not use it at all. 4 I strongly support the use of location-based services for emergency management as I believe that it could really help save lives. At the same time, I hope it is used only for these purposes so that people’s privacy could be retained. 5 I would like the telecommunications firms to use LBS but only for emergency situations ... But, the problem these days is that our privacy is violated by these companies, and would you believe these companies would treat our privacy in full confidence? These days we all supervised by the government, security cameras on the streets, and even sometimes these reach our rooms and houses. Moreover, spy satellites can identify and get us even in our own places. Would you accept that LBS violates our freedom? These technologies are pretty nice but only if we use them right. 6 It is a good idea, but can be very intrusive and annoying if advertising companies get access to it. 7 LBS sounds like a good service for emergencies. However, if a person can be located constantly wherever they are this may cause concerns about being ethical to know where someone is 24/7. While many would use it for good, some may use it to benefit their own behavior. 8 Whilst I can see the benefits of using LBS, I have major concerns over the fact that these mechanisms can be used to track my location. I understand that my mobile phone can easily give a rough location as this is just a by product of the technology of mobile phone towers. I do not want my exact location to be known 24x7. I believe the technology should exist where with 100% certainty the feature can be turned off. 9 Although I have a few concerns of being tracked by the service provider, if it does not impinge on rights of personal freedom too much, I think that it is valuable and definitely beneficial. 10 This is an interesting idea as long as it does not affect people’s privacy or personal life in any way. 11 LBS would be a great help in emergencies as long as it is not used to interfere with the privacy of people using it in daily activities. 12 Something like LBS would be exceptionally useful if the privacy concerns are looked at; then the advantages will outweigh the concerns. 13 For me, I am totally on board with the use of LBS for emergency management. The only concern that I have is the potential abuse of personal information. Organizations must handle personal information properly when no emergency exists. In addition to the lack of awareness about the seriousness of emergencies, and accordingly the possible benefits of LBS in such situations, people might also be unaware about the fact that providing mobile location information to the government in the case of an emergency is actually part of the service agreement package with all mobile service providers in Australia. Although these agreements only cover citizen-to-government (C2G) types of services, without any explicit mention to the government-to-citizen (G2C) service type. The possibility of provisioning such information is nonetheless consented by each person once he or she enters into a mobile phone service in Australia. Expert A reiterated the importance of this fact and emphasized that emergency warnings were an “information service” supported through service providers and definitely not a breach in privacy. It is a public service announcement and thus it cannot be opt-in or opt-out, “it is there permanently and you just have to accept it as being part of your acceptance of a service provision” (Expert A). In regard to privacy and location information, one of the key experts who has long worked with location-based technologies argued that the pervasiveness of mobile phones and the abundance of technologies and applications that successfully integrate location information as part of the regular service offerings have all helped to positively change the social attitude towards the use of the personal locational information. As the expert discerned, location information has become a “common topic” amongst the general public that does not raise high sensitivity today as it used to about a decade ago. According to Expert C, much of this has to do with time. At the turn of the millennium when 911 happened there was a lot of talk about new location-based applications like friend finders, child finders, local information, navigation and the reaction of the people was “ ‘Oh, I don’t like the sound of that’. There were the big brother implications. There were the surveillance implications. There were the government control implications ... [but] come forward ten years and the last few years in particular, and the proliferation of personal navigation devices, there is an increasing amount of comfort with things like GPS and knowing where you are.” Indeed the introduction of “free” services like Google Maps (e.g. StreetView and Latitude) has somewhat desensitized users on the one hand, and educated them on the potential application on the other hand. For Expert C, location-based emergency services are a “social service” that he could not believe would be a controversial or contentious issue with the general public, and definitely not an election winning issue. Expert C stressed the need to acknowledge the technical and physical limitations of the current telecommunications networks and positioning technologies in Australia, as these limitations would ultimately provide a rationale for the public to eliminate any misconceptions about possible infringements in privacy. It is worth quoting him in full: “[f]or a system like an authority to citizen warning service, there is that implication associated with the whole concept that you have to know where everybody is, and that actually ... is a significant technical challenge, practical challenge. A network operator cannot actually know moment to moment where everybody is. The actual determination and specific geographic location in a mobile network context requires resources, requires network signaling resources, it requires device resources if the device is contributing to the location determination. To be continually doing it moment by moment, to know where everything is actually is not a practical proposition. It is not a practical proposition with today’s technology. It is not even a practical proposition with foreseeable technologies because you have got to acknowledge that you are actually going to be consuming resources, and if it is moment by moment at arbitrarily small intervals that you are going to be consuming resources, it is something approaching infinity.” While Expert C raises some very important points to do with the feasibility of tracking citizenry moment by moment, the granularity of tracking still remains a relevant discussion point. Most people would agree that you do not require such fine granularity to understand the location profile of an individual. And as humans are creatures of habit, predictions are usually accurate to an established margin of error. What is perhaps irrational, beyond the technical feasibility of tracking and monitoring citizenry is why a government would actually wish to track everyone anyway. The Vic-Gov representative dismissed the idea completely: “... the things not going to be on all day long just monitoring who is moving in and out of a network all around the country.” She concurred with Expert C regarding the load such a scenario would have on a carrier’s network. She also believed that a carrier would not want the government probing and monitoring to that extent. Expert E also pointed out that no carrier would want to risk damage to its brand or reputation by using the available locational information potentially for purposes other than emergencies. “The carriers themselves are terribly concerned to make sure that they do not abuse... personally identifying information ... in a way that could result in almost any criticism” (Expert E). Expert B emphasizes that the community will accept that some of their normal rights will be limited or waived in the event of a state of emergency. In this instance, people might not only accept, but expect to be ordered around for their own good and survival. Nevertheless, there is still a need to clearly reflect the potential invasion of privacy in future government legislative amendments. The Whispir-Rep asserted: “I would like to see a recipient controlled system. That is the most respectful and appropriate way to engage communications. But that might not be practical. If there is a political will to or a desire to communicate to every handset, then all you are talking about is overriding people’s preferences and sending them a message regardless ... There are privacy issues to be dealt with. I am not saying that it is a reason not to provide a service but certainly the legislation needs to be changed to send a message to those people whether or not they have asked for them. 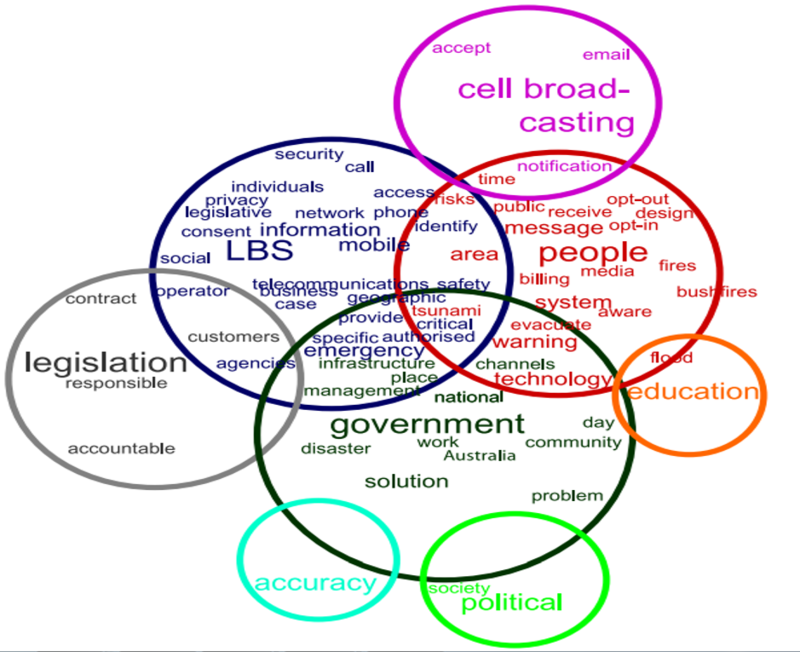 My understanding of the legislative framework is that it needs to be changed to this use case.” Finally, as there shall always be concerns from some individuals and associations about infringements in privacy, even if the intended purpose of location-based mobile phone service utilization is for emergency management, the government of Australia can genuinely help to alleviate such concerns through communicating a set of guarantees about the use, collection, and storage of the location information under location-based mobile phone emergency solutions. As the Redcoal-Rep insisted, a large part of it had to do with how the government communicates the need for such services in case of emergencies. Expert D puts it all in perspective by saying that there are always going to be privacy issues concerning the general public. “You have always got to have a sector of the community who will be concerned about whether that information is somehow leaked out or made available or used for other purposes. So, the community-related determinant matters between stakeholders would have to be assured that the collection of location [information] would only be for the specific purpose of warning you of a quite threatening emergency. And even in that case, any information collected by the agencies about your current location would then, somehow, be de-identified if the information needs to be stored.” A summary of trust, privacy and risk-related matters between stakeholders can be found in Fig. 4. It should be noted that the union between two stakeholders indicates the dominant matter at hand. For example, the dominant theme found in the analysis between “government” and “customers” is “Trust”. Had it not been for interstate disagreements, Australia would have already had a realized national location-based mobile phone warning system , some believe even as far back as 2006. Expert B discusses the problem as a lack of national coordination. A possible reason for this lack of coordination could be the lack of viable attractive business propositions of location-based mobile phone solutions through which emergency services can be successfully utilized on the national level in Australia. Expert B blamed the professionals involved who failed to come up with viable proposals for a national emergency warning system, and not due to a lack of political will. “I think it is partly that emergency experts need to get together with the technology computer experts and work out what to do because I cannot imagine the politicians are going to say: ‘No, we do not want a reliable integrated emergency warning system’. I think the problem is politicians will naturally react at short term. That is normal for them. So, you have to know how to cope with that when you are proposing something to them.” However, the lack of an inclusive national coordination to emergency management between the different States and Territories of Australia can possibly still be manifested in the decision of the government of Western Australia to keep its StateAlert emergency system instead of adopting the recently deployed national emergency warning system (NEWS). Under the COAG agreement, each state or territory retains full autonomy about the warning system it chooses to implement . This provides an impetus for the future need of an extensive collaboration between the government of Western Australia and other governments of Australia to resolve certain issues related to systems integration, regulations and legislative jurisdictions. Another potential barrier in the plight towards the realization of a national location based mobile phone emergency solution in Australia is the lack of a common approach for the warning notification between different emergency organizations in the same State or Territory. This is despite the fact that comparable government emergency organizations from different states or territories in Australia have developed equivalent warning notification arrangements to the general public in the case of a specific emergency event . This issue has also been noted by Expert B in the perceived need to get the relevant emergency authorities to agree on a common approach for emergency alerts before even talking technology. “[I]f you magically built a system to send everybody a message tomorrow, we still would not be able to send them messages because we do not have a coordinated decision-making process as to what message you should send.” This just further demonstrates that it is not merely a technology problem. Some of the financial implications of utilizing location-based mobile phone services within the national emergency warning system were identified by expert interviewees and survey respondents alike. Expert A said that the cost of such a system was a “huge impediment” to progress. The two options to overcome the cost barrier included waiting until things got cheaper to build, or waiting until the pressure from the public was so great that cost no longer was a factor because it was overtaken by need. “I think lots of people will have considered it but they probably were reluctant on the cost of it and how often it will be used”, commented Expert D. If we ponder that an early warning system of this nature will rarely be utilized yet has to be available 24/7, it is a hard sell. Indeed, several comments from the survey respondents actually raised people’s concern about the financial burden of these services once they are utilized. Some respondents were concerned that the service would be fee/tariff-based and that only those who could afford it could opt-in which would raise significant equity issues. “As long as there is no extra cost to users, it is alright”, noted one individual. And another said categorically, “[i]t should be cheap or free.” Nonetheless, all interviewees basically agreed that the responsibility lay with the federal, state and territory governments in financing location-based mobile phone emergency solutions under the national emergency warning system. Vic-Gov said, “[e]very Australian citizen has the right to be advised if they are likely to be life threatened ... it probably rests at both a Commonwealth and a Jurisdiction level, the funding of such a solution.” A complementary remark by a citizen was that the additional cost should be borne/ supplied by government and that part of the Goods and Services Tax (GST) should be allotted to the scheme. Australia does not invest much in technology to counter the effects of natural events compared to the country’s investments on counter-terrorism technologies and programs. This is despite the fact that terrorism attacks are very rare in Australia . Australia’s Federal Government cumulative investments on counter-terrorism programs, including public campaigns, has exceeded Aus$10 billion since the September 11, 2001 attacks, compared to only Aus$500 million in managing the potential consequences of a large-scale natural disaster occurring in Australia . Expert A argued that such small budgets have prevented Australia from exploiting or investing heavily in technology, including location-based technologies, specifically in countering natural emergency events. As he argued, the main reason for keeping these budgets small is Australia’s great reliance on voluntary manpower during these types of emergencies. Expert A said: “... although we follow best practice [in emergency management] ... the use of technology has been a little bit overlooked or not been as embraced as it could have been.” Expert A points to the fact that Australia has a great reliance upon volunteerism. So to an extent we are already dealing with emergency services that are heavily restricted by budget constraints. To start discussing the potential for a technology-based system that would require a significant outlay to begin with and then to operate and maintain is probably being exorbitant. The use of location-based mobile phone services implies the government’s commitment and need to adequately reach and effectively target all mobile handsets within a defined emergency area of all carriers in Australia . However, covering all of Australia with functioning mobile phone services would require massive investment in networking and underlying infrastructure, something that is not economically viable or practically feasible today or even in the near future, despite the notion of universal service obligation (USO) being so pronounced in Australia. For one respondent the vision of Australian-wide coverage was good but the reality was that the reception of signals was unreliable in some non-urban locales, and that things would remain the same until some major spending occurred. Expert A believed that this type of technology worked well in cities but for those who lived in smaller regional and rural communities the technology was not always reliable. He said, there was the potential for individuals to miss out on timely and valuable data. Expert A identified an issue of equity, when some members in the community would receive a timely message, and others would not. For looming emergencies that could be predicted 24–48 hours prior to enactment, timeliness was not such a great issue, but for those that needed more imminent warning, messaging to those greatest at risk was a problem. “We have a responsibility to all the communities and we should provide that equally. So, I think focusing on people that live in the urban areas because there are more of them is not actually doing what is best for the communities as a whole. And we should not go that way because we then start separating rural and urban. It becomes an equity issue as well and everyone is equally threatened by hazards in a place where hazards exist” (Expert A). To date the focus has been on providing communication services to Australia’s coastal strip but there is now a need to offer all Australians the same access to services. As one of its core obligations toward people, the Australian Government needs to seek a technology that is accessible by all mobile handsets in the case of an emergency. Constraints may be forced on location-based mobile phone emergency solutions if no such technology exists. The Redcoal-Rep advised: “[w]hatever service is developed, it has to be accessible by everyone. There is no point in having an emergency alert system that sends out emails when not everyone has an email address.” Unfortunately, none of the currently available technologies can fulfill the prime requirement of reaching every handset in the event of an emergency. In addition, the very few technologies that are accessible by most handsets working today do not represent an attractive solution to the Australian Government due to their coarse coverage definition and inaccuracies. These issues were clearly reflected in the comments of the official from the Victorian Government who specified the State’s thorough but unsuccessful efforts researching a technology that can be effectively utilized in location-based emergency systems on mobile handsets. The main issue is the existence of a mix of mobile technologies in Australia, and that 3G technology is not as straightforward as 2G. “I am not quite sure whether anything might even pop its head up, still on the 3G network that looks something like cell broadcast, but we will still have issues with the very large reach cells that are in more regional and remote locations. I do not have a good answer yet on how we would narrow that down when using something like cell broadcast. Where these things have been deployed elsewhere in the world, they are all based on cell broadcast. It is still a bit unknown even how well received or accepted they are” (Vic-Gov). So the geo-demographics of a given country have a great deal of impact on the success of location-based emergency solutions. 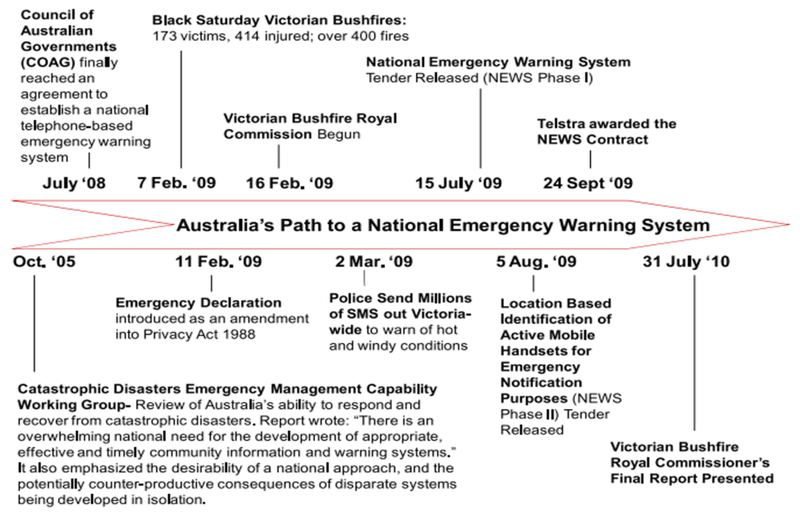 A summary of the barriers that held back the Australian government’s introduction of the national emergency warning system are depicted in Fig. 5, juxtaposed against the mechanisms that supported their ultimate deployment. Other concerns about a SMS solution have also been voiced by other interviewees, specifically the scalability of its underlying technologies for mass public warning purposes. This concern was, particularly, expressed in response to recent trials in Australia in which several State governments used SMS to disseminate safety information to the people. Expert B was clear that neither the fixed landline solution nor the SMS solution was workable or would scale. Expert D supported this opinion, “[t]hey need a system that is definitely scalable from sending ten messages a minute to 100,000 messages in seconds or whatever. The scalability is a major issue.” In addition to SMS, concerns about cell broadcasting technologies have also been expressed since these technologies do not represent an attractive option for emergency management purposes. Expert B admitted to liking cell broadcast technology in mobile phones but added that it was not well supported by carrier or handset manufacturers. Expert D acknowledged that while cell broadcast was a feature that some ninety percent of mobile phones had set to default, that some handsets would have it turned off, leading to major issues after an emergency. One advantage of SMS over cell broadcast is that SMS was usually carrier independent, but from a performance point of view it is quite smart to get the cell tower to broadcast a message to all mobile phones in range (Expert D). However, most people are not familiar with cell broadcast or have not knowingly used it before, so “[f]rom a public acceptance point of view there would need to be some form of public awareness campaign because you do not just simply want someone right now to simply receive all these cell broadcasts and not knowing where they are from and what they all really mean” (Expert D). Similar concerns about the cell broadcasting technology have also been shared by the Victorian Government official. She stated, “we have pretty much discounted it as the means by which we would move forward, because it is too coarse and it is too broad in its reach. And we are very specific, as good emergency management practices would say that you only notify the individuals that are within the area of the likely impact.” In Australia, going down the path of cell broadcasting for emergency warnings would probably mean that people who should not be contacted for a given warning are, due to the large cell size. As a result, you might have people who are completely disconnected to a warning, preparing as if they would be impacted, only to find the message is entirely irrelevant to them. This could have the effect of desensitizing the individuals from future warning alerts, like the boy who cried wolf. Such a message, depending on the directions given by the authorities, bring people closer together to an epicenter of a problem, rather than keeping people who are not connected with the emergency out of the affected zone. As an example, the Vic-Gov official spoke of a certain cell within Australia that had up to 18 kilometers of reach. She then went on to provide a scenario of an emergency that only needed to notify persons within a one kilometer radius from where the centroid of the cell was located. It quickly became apparent in this scenario that by using cell broadcast, there would have been “over-notifications” and the target segment of persons affected “over saturated.” Who knows what the effects of advising people 17 kilometers away from the epicenter of the problem would be, beyond the obvious issue that people would begin to feel that warnings were just irrelevant or unreliable to them in the future. While there is a need to build a solution that evolves over time, by embracing newer technologies, a careful consideration should nonetheless be given to enable backward compatibility, allowing the solution to reach every handset still in service, including legacy devices. While evolvability is a key, as Expert A put it, “technology is always changing.” What is important is that the chosen technology is “equitable to everyone ... So, the service has to be at the lowest common denominator rather than the highest. It has got to be able to go out to the person who has the oldest machine rather than the latest.” One must not be at a disadvantage because of the device they use, and people with smart phones should not be in an exclusive club any more deserved of receiving warning messages than anyone else. There is a need to build a solution that can withstand the severe effects of extreme events and be resilient enough to be ‘self-healing’ if disrupted for any reason. Expert D considered technical issues which would need to be resolved if mobile services were used near hazards like fires. Fires might, for instance, affect the actual channels of communication, and as a result reduce the ability to get messages out to the people who need them most. According to Expert D, these issues have yet to be resolved, despite their seeming simplicity. There is also the fundamental problem of extreme conditions that would render cell towers inoperable which are all part of the deployment issues that need to be considered when rolling out a national emergency service based on mobiles. “Even in a flood or a cyclone, if all your cell towers get blown over or lose power then your messages going out to location-based devices are going to be affected” (Expert D). Carriers in Australia, in cooperation with government authorities, have demonstrated that networks can be quite resilient even under the worst conditions (e.g. Cyclone Larry) and are particularly prepared to get business customers back up and running after a disaster within 24 hours wherever possible. One survey respondent said that “fail-safe’ technological systems need to be introduced as far as that is possible ...” So, from a deployment point of view the chosen system needs allow for the rapid set up of mobile phone towers to get the message out to people. There is a need to avoid the ad-hoc uncoordinated approach in designing location based emergency solutions. Expert B was clear that if the government, the emergency agencies and the IT professional did not design the national warning system properly, that “lives [would] be lost and they [would] be held legally and criminally liable as a result.” Expert B was worried by this haphazard approach, examples of which emerged from the Victorian Bushfires Royal Commission. The content of the location-based warning message has to be crafted with great care, lest individuals receiving the message misinterpret warnings and directions. It cannot be complex. Expert A spent some time discussing the issues around mobile communications from the Government. He said the information sent out to the public had to be accurate and well intended, effective, correct at the time of delivery and from the very beginning well thought out and structured. There need to be clear guidelines that in the event of a problem in communications or interpretation that the next time a message is sent out the authorities get it right, so that the public do not become complacent or lose faith in the medium. The public need to understand that every personalized message they receive is urgent and is not just being sent out as a matter of course. It must not be treated as just another piece of junk mail. It has to be both professional and appropriate. In addition, the dissemination of location-based mobile phone warning notification should adhere to well-defined protocols to assure the correctness of the message content and its intended destination. Misinformation or even disinformation would just add to the woes of an emergency response. Expert A insisted that there must be strict protocols for the dissemination of information and they must be adhered to, just like the processes that are presently in place with communicating emergencies to inform the media who then in turn inform the general public through traditional channels. “Currently, we have processes in place for informing the media, and it goes through a series of checks, certain people are only allowed to inform the media of things. They have special training in media management, they provide media releases, they are written in a certain way, they are vetted and then it goes out and it is put out” (Expert A). However, if we liken the correspondence on mobile phones to that more attuned to email communications, rather than television or radio, we begin to see the risks more clearly. “When it is instantaneous, you tap something on a computer screen and it is gone. You cannot retract it. So, the protocols have to be in place to ensure that only the right information goes out” (Expert A). Moreover, the content of the message must be carefully chosen to match the exact intended purpose of the warning. And this, all within the context of a warning which needs to be sent out not hurriedly but in a timely fashion. A warning that does not arrive on time to avert disaster, is not a warning at all. And yet, despite the urgency “[t]here needs to be some hard thought and consideration to the content of the message depending on what the event is” (Vic-Gov). Some events will be easier to determine content for than others while other events might require multiple messages to be sent in succession as the nature of the disaster unfolds hour by hour. In the latter instance a “close-out message” would be advisable as you do not wish to have people waiting in anticipation and with some level of anxiety over next steps. Vic-Gov provided the following example of a chemical spill situation. “[T]he initial message maybe to inform the people who have been potentially affected by that chemical spill to go indoors, shut their door, turn off their air-conditioning. So, we have given them the message to keep them safe, depending on how long the impact of that chemical spill remains for. We need to also keep those people updated, I believe, and that might be an hour later, two hours later. We certainly also need to provide those people with a close-out message to tell them that it is now safe to open their door and open their windows” (Vic-Gov). But, in addition to the content of the warning message the way the message is conveyed, being in text or voice, should be carefully considered, taking into account the timing of the emergency event. Vic-Gov demonstrated their advanced understanding on the topic when they pondered on the time-of-day issue. “If the event is occurring at night particularly, or in the very early hours of the morning a text message may not wake somebody up. And we are also pretty certain that there is a technology which will allow us to over the air, kind of, send an update to particular handsets before the messages got sent, and that could be an over the air distinctive type of siren, or it could be something more like a ringing of the phone and then deliver a text message.” It was also noted that unified messaging would be at play. A message sent between midnight and 4.30 a.m. would be in the form of a voice message, but otherwise text-based. Finally, with the right technological advances the message designers should consider at some stage the rich ethnic diversity of Australia and the need to provide an option for the message recipient to choose the language of the location-based mobile phone warning message like most other electronic government services currently available to the public in Australia today. These issues are already within the interest of the Australian Government. While Vic-Gov was only considering the message content to be in English, they were open to the idea of—way down the track—to send the message in a translated form. Vic-Gov said this would be the only case in point for an add-on opt-in channel feature. The location-based mobile phone warning system should only be used in case of a large-scale emergency or imminent disaster. As the SES pointed out: “[a]m I going to go and wake up a million people at 2 am in the morning to tell them there is a thunder storm coming through?” Expert A agreed with SES when he said: “[i]t cannot be something that is used on a daily basis for minor things, because we will end up causing grief to ourselves. It should only be used in situations that are deemed, where it is the only means of getting information out quickly.” For Expert A, other existing channels of communication could be used in situations where information did not have to go out immediately, such as in news reports on television and radio, etc. What you do not want is a system in place that people actually complain about as opposed to appreciate. An optimum level of notifications needs to be achieved, as the frequency of receiving a notification may be a determining factor of the system’s usefulness by the general public. This issue has been recorded before in other emergency warning systems, as the representative of the State Emergency Services explained in more detail. “They [the Government] put these big signs on top of big sticks and they test them every day. And so, if the dam goes over the siren goes and after a couple of years the people got so sick of the thing going off. They go up and cut the wires. They did not want to know and it was becoming painful. That is a reality. That is another part of it, people’s perception. Do I want to be warned? People do not want to know about disasters, until they go wrong, and this is precisely what happened in Victoria” (SES). The Whispir-Rep reiterated the comments of the SES: “[t]he introduction of these technologies should be managed carefully so as not to lose face with the public.” The Whispir-Rep recounted that shortly after the Victorian Bushfires, every person in Victoria and Tasmania were sent messages by their carrier which “broke all the rules in terms of communication management.” Such messages actually have the propensity to harm mobile government communications. By their very nature they are disregarded by people because they are not real: “[s]o, the whole idea of this is the context of the boy who cried wolf too many times. What we want to see is fewer communications sent but those communications sent are targeted, well structured communications that people would be anticipating” (Whispir-Rep). Just like any solution on the market, location-based mobile phone emergency solutions also have their limitations that need to be acknowledged by all parties from the outset. The first reality is that no matter how hard the government tries, they are never going to get 100 per cent coverage because people will have their phones turned off. “So, it is really important to understand the operational context in terms of what you are trying to achieve and what is a realistic outcome” (Whispir-Rep). At a more practical level, the SES emphasize the limitations of human comprehension, despite the brevity of the message, content can be misinterpreted. “Based on work we have done we know factoring in evacuations you need to provide time for message assimilation. I think when you are looking at a telephony-based warning system or an SMS one, some of the limitations is that you can only have a very small message. It is more about how to get somebody’s attention to then go and do something else, to go and get more information” (SES). The short message sent to the mobile phone can be likened to a siren. If nothing else, the siren gets your attention, so that you can listen to the radio, turn on the television, or pay closer attention to the directions given by in-person emergency services staff in the vicinity of the emergency. It is certainly not straightforward, and at times utterly complex when you are trying to tell people what to do or not to do based on their given circumstances. According to the SES there would be a specific notification sequence so that evacuation routes are not congested, causing even greater problems in surrounding areas. This would be extremely difficult to implement using a SMS system. Toward a comprehensive national approach for location-based mobile phone emergency systems, there is a need to involve not only all levels of government in Australia but also to effectively acquire the participation of every voluntary and nongovernment organization (NGO) in Australia that has a close relation, one way or another, to emergencies. For Expert A, there needs to be an inclusive participation from all areas of government. Government agencies are ultimately responsible for communities. And if a Government notifies people to “evacuate”, there needs to be some explanation of the best method of evacuation. Not everyone who receives a message to evacuate is physically mobile. And what you do not want is a state of panic and to be flooded with calls coming back questioning directions. Some members of the community will need assistance in acting on directions. Expert A suggests that early warning systems are actually a “partnership between the system being put in place and the types of activities required for those notifications to be planned for and more effectively carried out. You may end up having to use local service groups, volunteer organizations to assist in doing some of the actions that are required, for example, the evacuation or the management or the leading of people to safe areas.” It will most certainly be a partnership between government agencies, local community groups and welfare and support groups that are called upon in normal emergency management practices. These are the groups that will especially have to embrace location-based mobile phone emergency notifications as they continue to provide their services on a voluntary basis. Expert D also identified a consultative stakeholder group that was as wide a group as possible to ensure acceptance. Expert D reflected, “I think that it is very critical that you incorporate as much consultation with a wide group as possible, because it is relatively fragmented in terms of the different federal, state and local levels, all have their own sort of emergency management groups and strategies, and it is always quite important that everyone be involved in any type of new system being developed or evolving. Otherwise, your acceptance level will be very low. If you do not do that, then you will find people saying: ‘Well, we were not involved in that consultation so we are not going to accept whatever the outcome is of that consultation’ ” (Expert D). How best to avoid such panic is to work on building resilient communities. In a severe event, the SES or other emergency services personnel will probably not be able to reach individuals given the amount of infrastructure that has been damaged. During this time, individuals, families, business owners, need to work together to overcome hardship. This has very little to do with location-based services per se and more to do with social networking. In fact, what might eventuate is that support groups begin to post messages online to help people share vital information and provide feedback to government authorities of the situation on the ground, if a disaster is to continue for some time. While the SES acknowledged there might be some problem with the cultural mix in Australia, education was a key to breaking the barriers when it came to people in the community helping one another. “What we need to be moving to is to that preparedness mitigating mindset, where we are educating our children and our communities how to prepare for a natural disaster. You have got to take it back to the beginning. The preventive side of things. You have got to stop people being in situations and then of course if they are going to be in those situations prepare them for what needs to be done” (SES). Fortunately, educating the public is a concern that is already on the agenda of the Australian Government. Vic-Gov confirmed that they had always planned to deploy this type of technology with a substantial education campaign. “It is not simply education to the public, it is education within the various emergency service agencies. It is education through all layers of other interested parties as well” (Vic-Gov). These would include, among others, principals or authority figures of schools who have hundreds of children under their care on a daily basis. Education would be necessary wherever there was a large concentrated gathering of people. Vic-Gov followed up by providing the following examples: major places of interest, building managers, shopping centre managers but added that she was unsure whether she had yet considered all the layers and levels that would go into a substantial education campaign. Realizing location-based mobile phone emergency services on the national level in Australia requires the effective collaboration between all the telecommunications carriers of Australia, not just the incumbent operator. The Redcoal-Rep imagined a better collaboration between the major carriers was needed, and noted that this relationship would be significant if the service was to be successful. Indeed there is a need not just for carriers and service providers to better collaborate but for the business side to be more in tune with the government mandate(s). In the context of emergency services, one cannot solely talk about an innovative business model but about the jointly developed government and business model that is required to get such a service off the ground. The participation of the mobile telecommunications carriers in Australia is central in location-based emergency systems. The Whispir-Rep stated categorically, “[n]othing is going to happen without the support of the carriers.” This was also expressed by the Victorian Government official: “[t]o collect the data, we need the cooperation of the carriers.” The carriers are able to provide a fundamental piece of the puzzle in that they know the make-up of their infrastructure better than anyone else, and they can provide details of their assets, their sites, their cells and even their customers, if required. Vic-Gov noted the need for this data would be to purely know to whom they should send out the message to the active handsets that have been identified. There has been some contention over whether or not a carrier should charge for such a service during an emergency to the general public but the overwhelming consensus in Australia’s case, is that the cost should be borne by the government. This does not mean that the carrier does not receive any revenue. On the contrary, by the mere fact they are sending a message to a handset, the revenue must go back to them (Vic-Gov). Accordingly, utilizing the carrier networks to provide location based mobile phone emergency services strongly imposes the cost factor as one of the possible determinants of their participation. The Whispir-Rep is clear that the government must engage the carriers with respect to emergency service messaging of this nature, as such a system would place a heavy load on the infrastructure of any mobile network provider. In addition, more infrastructure would be required to enable the government the capability to speak to everyone’s mobile handset in a given area. Unless carriers receive some type of subsidy or have an interest in the solution or outcome, they would be unlikely to make such a significant outlay for little in return. 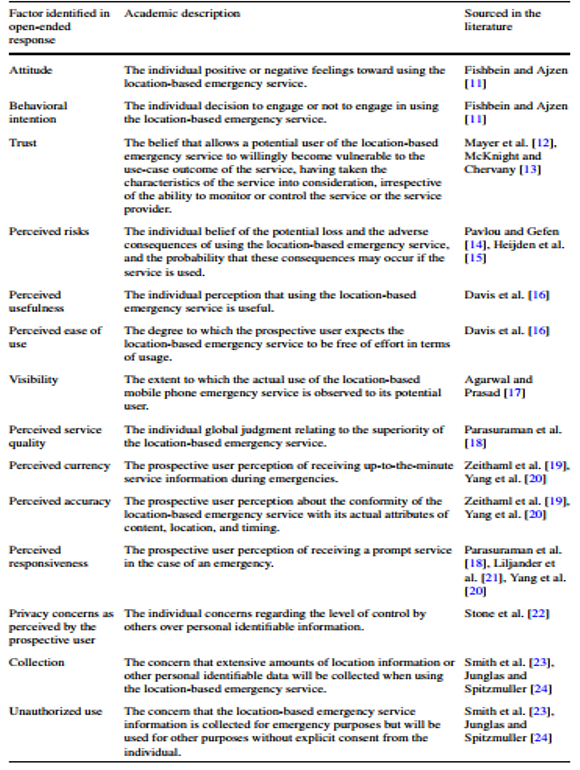 This paper presented the results of a qualitative study into the issues surrounding the national utilization of location-based mobile phone emergency services in Australia, as articulated by the stakeholders of the services. The results of the analysis showed Australia’s need for the application of location-based mobile phone services within the country’s national emergency management arrangements, and the need to regulate and control the services under a well-defined legal framework. Several disagreements between stakeholders were recorded in the analysis over some of the issues pertaining to the utilization of the location-based mobile phone service within the national emergency warning system, specifically in relation to some of the design aspects of the location-based emergency system, the privacy of location information under the system implementation, and the administrative structure needed to deploy the services. Other issues of importance were also revealed. These included the government and telecommunications carrier potential liabilities under the utilization of the national location-based mobile phone emergency system, the expected responsibilities and roles of the government and other stakeholders in the utilization, and some of the social implications of the location-based government emergency services, such as people’s trust in the services and in the government, and the risks perceived as associated by utilizing the services. Potential barriers to the national utilization of the services and recommendations toward setting realistic objectives for the services in Australia are also presented. What is clear from the study is that future mobile government applications will require a greater interplay between stakeholders, including telecommunications carriers and supporting value chain members and the general public who are the ultimate end users of such a system. Such personalized communications between government entities and citizens has begun to occur on electronic commerce systems related to taxation and social security but the introduction of personalized communications based on the location of a mobile device is heralding in a new breed of adaptive solutions that will revolutionize the manner in which people respond to their context. 1. Marshall, C., & Rossman, G. B. (1999). Designing qualitative research (3rd edn.). Thousand Oaks: Sage. 2. Cecez-Kecmanovic, D. (2001). Critical research in information systems: the question of methodology. In E. M. Trauth (Ed. ), Qualitative research in IS: issues and trends (1st edn., pp. 141–163). Hershey: IGI Publishing. 3. Hennink, M. M. (2008). Emergent issues in international focus group discussions. In S. Hesse-Biber & P. Leavy (Eds. ), Handbook of emergent methods (1st edn., pp. 207–220). New York: Guilford Press. 4. Office of the Emergency Services Commissioner (2008). Office of the Emergency Services Commissioner. Department of Justice. Melbourne, Victoria. Available via. http://www.justice.vic.gov. au/wps/wcm/connect/DOJ+Internet/Home/About+Us/Our+Organisation/Business+Area+Profiles/ JUSTICE+-+Office+of+the+Emergency+Services+Commissioner. Accessed 20 November 2008. 5. The NSW State Emergency Service (2008). About the SES. Wollongong, New South Wales. Available via. http://www.ses.nsw.gov.au/about/. Accessed 09 April 2009. 6. Whispir Company (2009). The Whispir story. http://www.whispir.com/about.do. Accessed 17 September 2009. 7. Redcoal Company (2009). Enterprise SMS Solutions: Email SMS/Web SMS Solutions: Mobile Phone Tracking. http://www.redcoal.com/. Accessed 17 September 2009. 8. Miles, M. B., & Huberman, A. M. (1994). Qualitative data analysis: an expanded sourcebook (2nd edn.). Thousand Oaks: Sage. 9. Patton, M. Q. (2002). Qualitative research & evaluation methods (3rd edn.). Thousand Oaks: Sage. 10. Leximancer Company (2010). Leximancer: from words to meaning to insight. https://www. leximancer.com/. Accessed 16 June 2010. 11. Fishbein, M., & Ajzen, I. (1975). Series in social psychology. Belief, attitude, intention, and behavior: an introduction to theory and research. Reading: Addison-Wesley. 12. Mayer, R. C., Davis, J. H., & Schoorman, F. D. (1995). An integrative model of organizational trust. Academy of Management Review, 20(3), 709–734. 13. McKnight, D. H., & Chervany, N. L. (2001). What trust means in e-commerce customer relationships: an interdisciplinary conceptual typology. International Journal of Electronic Commerce, 6(2), 35–59. 14. Pavlou, P. A., & Gefen, D. (2004). Building effective online marketplaces with institution-based trust. Information Systems Research, 15(1), 37–59. 15. Heijden, H. V. D., & Ogertschnig, M. (2005). Gaast Lvd effects of context relevance and perceived risk on user acceptance of mobile information services. In The 13th European conference on information systems (ECIS 2005), Regensburg, Germany, May 26–28 2005. 16. Davis, F. D., Bagozzi, R. P., & Warshaw, P. R. (1989). User acceptance of computer technology: a comparison of two theoretical models. Management Science, 35(8), 982–1003. 17. Agarwal, R., & Prasad, J. (1997). The role of innovation characteristics and perceived voluntariness in the acceptance of information technologies. Decision Sciences, 28(3), 557–582. 19. Zeithaml, V. A., Parasuraman, A., & Malhotra, A. (2000). A conceptual framework for understanding e-service quality: implications for future research and managerial practice (Working Paper 00-115), Marketing Science Institute, Cambridge, Massachusetts, Accessed 09 November 2007. 20. Yang, Z., Peterson, R. T., & Cai, S. (2003). Services quality dimensions of Internet retailing: an exploratory analysis. Journal of Services Marketing, 17(7), 685–700. 21. Liljander, V., Van-Riel, A. C. R., & Pura, M. (2002). Customer satisfaction with e-services: the case of an on-line recruitment portal. In M. Bruhn & B. Stauss (Eds. ), Jahrbuch Dienstleistungsmanagement 2002—Electronic Services (1st edn., pp. 407–432). Wiesbaden: Gabler Verlag. 22. Stone, E. F., Gueutal, H. G., Gardner, D. G., & McClure, S. (1983). A field experiment comparing information-privacy values, beliefs, and attitudes across several types of organizations. Journal of Applied Psychology, 68(3), 459–468. 23. Smith, H. J., Milberg, S. J., & Burke, S. J. (1996). Information privacy: measuring individuals’ concerns about organizational practices. MIS Quarterly, 20(2), 167–196. 24. Junglas, I., & Spitzmuller, C. (2005). A research model for studying privacy concerns pertaining to location-based services. In The 38th annual Hawaii international conference on system sciences (HICSS’05), Hawaii, January 3–6 2005. 25. Punch, K. F. (2005). Introduction to social research: quantitative and qualitative approaches (2nd edn.). London: Sage. 26. The Victorian Bushfires Royal Commission (2009). Victorian Bushfires Royal Commission interim report. Parliament of Victoria, Government State of Victoria. Melbourne, Australia. Available via. Accessed 03 October 2009. 27. The Victorian Department of Treasury and Finance (2009). Request for Information (RFI) for: location based identification of active mobile handsets for emergency notification purposes. RFI Number: SS-06-2009. Melbourne, Victoria. Available via. https://www.tenders.vic.gov.au/tenders/tender/ display/tender-details.do?id=87&action=display-tender-details&returnUrl=%2Ftender%2Fsearch%2 Ftender-search.do%3Faction%3Dadvanced-tender-search-closed-tender. Accessed 19 November 2009. 28. Garfinkel, S. (2000). Database nation: the death of privacy in the 21st century (1st edn.). Sebastopol: O’Reilly & Associates. 29. Rule, J. B. (2007). Privacy in peril: how we are sacrificing a fundamental right in exchange for security and convenience (1st edn.). New York: Oxford University Press. 30. Bita, N., & Sainsbury, M. (2009). Bungling silenced Victoria Bushfires warning. Available via. http://www.theaustralian.com.au/australian-it/bungling-silenced-victoria-bushfires-warning/storye6frgamf-1111118829671. Accessed 02 August 2009. 31. The Australian Government: Attorney General’s Department (2009). Rudd government implements COAG agreement on telephone-based emergency warning systems (joint media release). Barton, Australia Capital Territory. Available via. http://www.ag.gov.au/www/ministers/mcclelland. nsf/Page/MediaReleases_2009_FirstQuarter_23February2009-RuddGovernmentImplementsCOAG AgreementonTelephone-BasedEmergencyWarningSystems. Accessed 02 August 2009. 32. The Australian Government: Department of Transport and Regional Services (2004). Natural disasters in Australia: reforming mitigation, relief and recovery arrangements. Commonwealth of Australia. Canberra, Australia. Available via. http://www.ema.gov.au/www/emaweb/ rwpattach.nsf/VAP/(99292794923AE8E7CBABC6FB71541EE1)~Natural+Disasters+in+Australia+ -+Review.pdf/$file/Natural+Disasters+in+Australia+-+Review.pdf. Accessed 18 February 2009. Anas Aloudat is a Ph.D. candidate in the School of Information Systems and Technology, at the Faculty of Informatics, at the University of Wollongong. His thesis is investigating the utilization of nationwide location-based services for emergency management within Australia from social and behavioral perspectives. Mr. Aloudat holds a Master of Science in Computing from the University of Technology, Sydney (’03), and a Bachelor of Science in Computing from the Faculty of Science at Mu’tah University in Karak, Jordan (’93). He is presently a sessional lecturer/tutor and research assistant at the University of Wollongong. He is a member of the Civil Emergency Alert Services Association (’07), a member of the Disaster Preparedness and Emergency Response Association (’09), a member of the IEEE Society on Social Implications of Technology (’09) and has been a member of the Research Network for a Secure Australia since 2006. The authors dedicate this paper to the 173 people who lost their lives in the Black Saturday Victorian Bushfires in Australia on February 7, 2009.